Rosemary was used to enhance circulation, stimulate the scalp, and relieve conditions such as flaky scalps and thinning hair. It was used to darken dark hair and to keep hair glossy. The herb was used to improve dry, mature skin, help reduce redness, and to alleviate acne and eczema. Rosemary water was used as an eye wash to refresh and reduce puffiness. Recent use has been in slimming products for cellulite, broken capillaries and varicose veins. 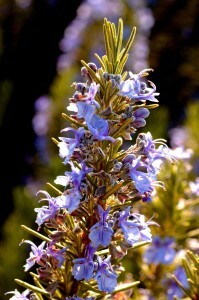 Rosemary oil has been used for mental fatigue and sluggishness. It enhances mental clarity and balances intense emotions and mood swings. Due to its anti-bacterial properties, Rosemary is used against infections. Rosemary improves circulation and assists in the drainage of lymphatic fluid, which led to its use in helping to treat joint pain, muscle spasms, digestive and liver discomfort, and minor respiratory conditions. Rosemary oil and extracts should not be used by women who are pregnant and should not be used on young children. Rosemary Essential Oil should be diluted before use.